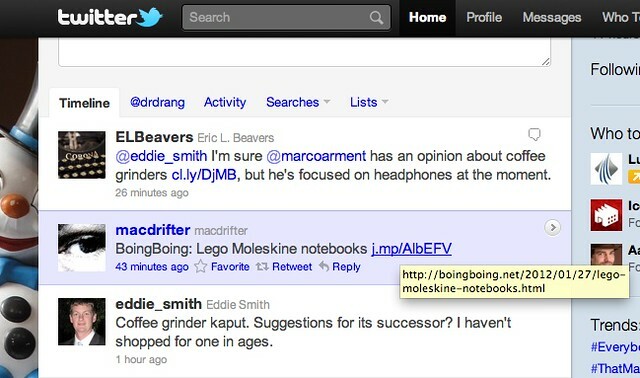 Something weird is going on with Twitter’s shortened links. I don’t know how it’s happening, but there must be several people on Twitter who think I’m using fake accounts to spam them with links to one of my posts. I get many visits from people following links from the t.co domain, Twitter’s own link shortening service. That isn’t unusual. Like many bloggers, I often tweet a link to a post I’ve just written. But when a post I didn’t tweet about starts getting hits from t.co, it means someone else has tweeted a link to me. Obviously, if my Twitter handle is included in the tweet, there’s no mystery; I’ll probably already have seen the link in my mentions. Sometimes, though, the link comes without a mention, and if I have the time I try to find out who did it. Yesterday morning I was home from work, trying to fight off the beginning of a cold (unsuccessfully), so I had the time. 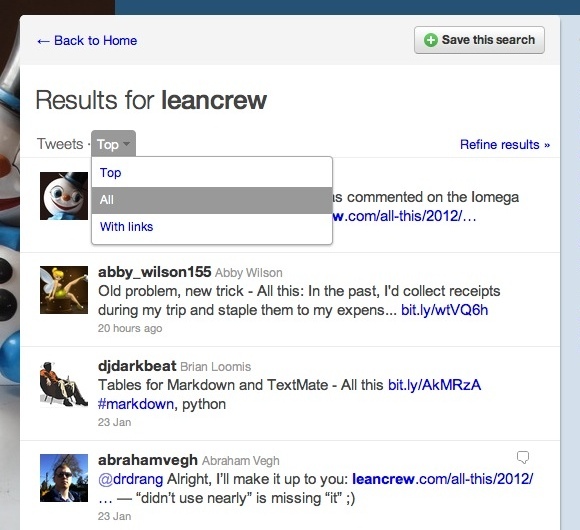 I went to twitter.com and searched for “leancrew.” Twitter initially shows the “top” tweets, using whatever algorithm it has for determining “top,” but you can switch to “all” tweets from a little popup menu near the top of the page. 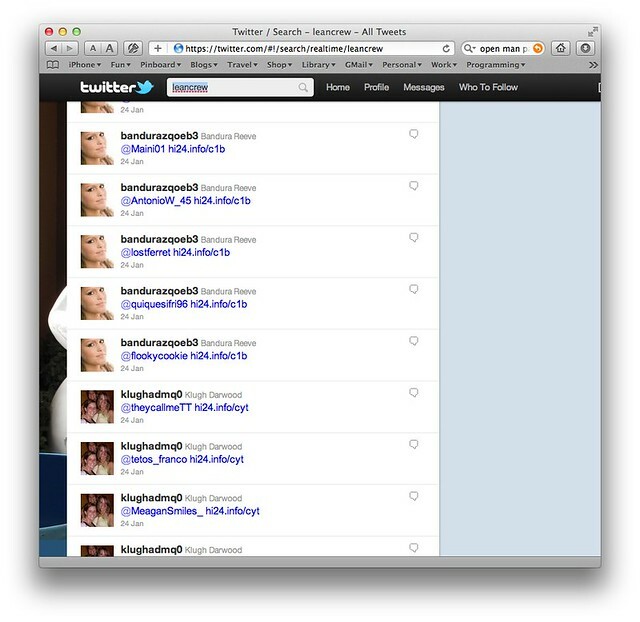 When I did that, a bunch of obvious spam appeared in the results. 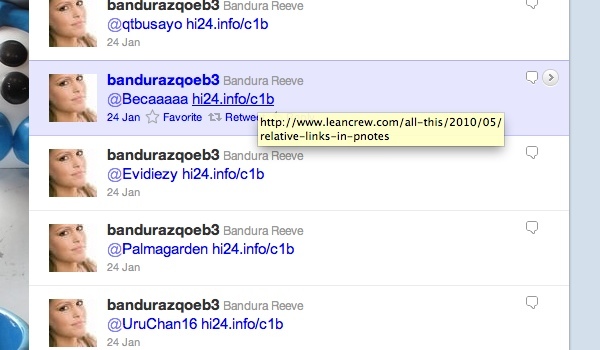 “Leancrew” didn’t appear in any of these tweets, but by hovering over the link I could see the URL of one of my posts in the popup. WTF? You won’t be surprised to learn, I’m sure, that clicking those link takes you not to my post but to a site that purports to be giving away iPads. So why does the little popup show one of my URLs? My understanding of that popup is that it’s supposed to show the resolved URL of the link, that is, the URL at the end of the redirect chain. For example, if you just post a regular, direct URL into your tweet, Twitter will turn it into a short t.co link which redirects to the original. That’s one step of redirection. If, however, you paste a j.mp link into your tweet, Twitter wraps that into a t.co link before posting and you now have two steps of redirection: from t.co to j.mp and then from j.mp to the original site. 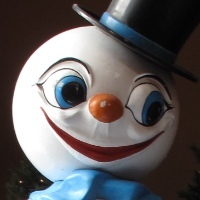 The url is the t.co-shortened link that Twitter made, the expanded_url is the j.mp URL you pasted into the tweet,1 and display_url is the text that appears in the tweet. 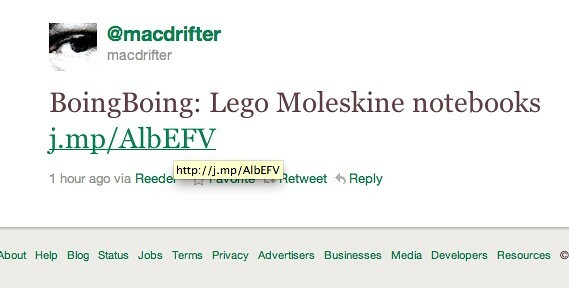 If you look at this tweet on its own page, you’ll see that the popup shows the expanded_url. But if you look at it in search results or a timeline, the popup shows the resolved URL that j.mp redirects to. Somehow, then, when Twitter resolves that hi24.info URL to make the popup, it resolves to my post; but when a user clicks on it in a browser, it resolves to the spam page offering free iPads. To me, the weirdest thing is after redirecting to oldcarrierreviews.info, it redirects to google.com (twice). I don’t understand how a google.com request ends up at a spam page. Anyway, to bring this rambling post to a close, my guess is that h124.info uses the headers of the HTTP request to figure out whether it’s getting an inquiry from Twitter or from a normal browser. If it’s from Twitter, it returns an inoffensive URL (like mine); if it’s from a browser (or wget), it sets off the chain of redirects that lands at the spam page. I’m kind of pissed at this. I don’t want my domain associated with spam, but I don’t know how to stop it. It’s similar to when email spam spoofs your address, but I think most people know by now that email addresses can be spoofed. Twitter’s stated reason for wrapping all links in t.co redirects is to reduce spam and keep us safe. In this case, not only is the spam getting through (the @bandurazqoeb3 and @klughadmq0 accounts are still active as I write this), but the users getting these spams would be justified in thinking I have something to do with them. I tweeted a complaint to Twitter’s @spam account but got no response. When I’m done posting this, I’ll go through the steps in this security form to report the issue. But I don’t see my career as an inadvertent Twitter spammer ending soon.